The Himalaya, which is a great natural frontier for India, symbolises India’s spiritual and national consciousness. The Himalayan region displays wide diversity of cultural patterns, languages, ethnic identities and religious practices. Along the Himalayas converge the boundaries of South and Central Asian countries, which lend a unique geopolitical and geo-strategic importance to this region. 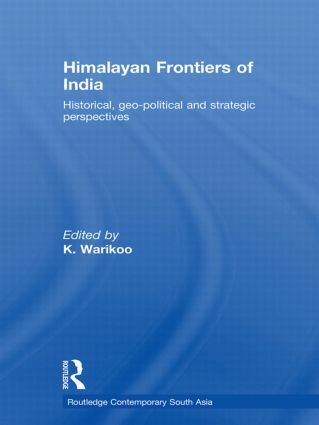 This book provides a comprehensive analysis of historical, geo-political and strategic perspectives on the Himalayan Frontiers of India. Drawing on detailed analyses by academics and area specialists, it explains the developments in and across the Himalayas and their implications for India. Topics such as religious extremism, international and cross border terrorism, insurgency, drugs and arms trafficking are discussed by experts in their respective field. Himalayan Frontiers of India will be of interest to scholars in South and Central Asian studies, International Relations and Security Studies.